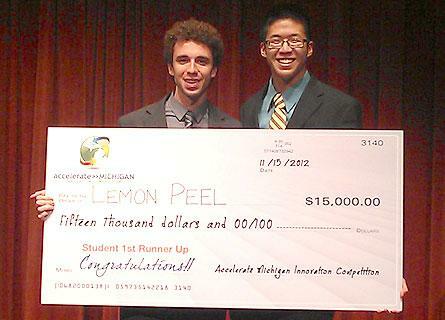 Two Hope College seniors who are participants in the Hope Entrepreneurship Initiative (HEI) have won second place in the student section of the Accelerate Michigan Innovation Competition for their “Vital Sleep Band” designed to help hospitals monitor patients while the patients themselves get a good night’s rest. Seniors Scott Brandonisio of Troy and Sam Tzou of Midland received $15,000 on Thursday, Nov. 15, as First Runners-Up in the competition, held at the Westin Book Cadillac hotel and Detroit Orchestra Hall in downtown Detroit. The “Vital Sleep Band” is a headband that actively cancels exterior sounds, removes light and collects a hospital patient’s vital signs. The signs are then transmitted to a hospital’s central nursing station, while the patient sleeps soundly. Brandonisio obtained a provisional patent for the device in July. Earlier this month, the concept won $5,000 from Grand Rapids-based Start Garden to support assembly of the technology to transmit the signal from the sleep band to monitors. In October, the project received a $7,500 grant from the Grand Rapids Smartzone Business Accelerator Fund to support creation of a prototype of the device. Brandonisio, an engineering major, has been working on a headband for sleeping since 2011, including full-time for 10 weeks that summer through HEI’s 10-week Summer Fellowship Program, which provided guidance and connections to entrepreneurial alumni. Through HEI he met Dr. David Lowry, a Holland physician and Hope alumnus who advised him to consider creating a headband that monitor patient vital signs. He received use of laboratory space on campus through Dr. John Krupczak of the college’s engineering faculty. Tzou joined Brandonisio as a business partner this summer while working for HEI. A management and Spanish major and chemistry minor, Tzou has social entrepreneurship experience from his volunteer work focused on youth in Zambia. The two students have continued to receive mentorship support through HEI. The international Accelerate Michigan Innovation Competition targets mid-to-late-stage business start-ups with potential to generate an immediate impact on Michigan’s economy, as well as student concepts with longer-term business viability. Top prize for the student competition is $25,000; the Second Runner-Up and a People’s Choice Award winner each receive $10,000. Additional information about the “Vital Sleep Band,” as well as about the HEI experience, is available online at: hope.edu/academic/leadership/entrepreneurship.htm. Hope College is presenting its annual fall student dance concerts on Monday and Tuesday, Nov. 19 and 20, at the Dow Center dance studio, and on Monday and Tuesday, Dec. 3 and 4, at 8 p.m. at the Knickerbocker Theatre in downtown Holland. Christmas Vespers, a Hope College and Holland tradition now in its eighth decade, will continue on Saturday and Sunday, Dec. 1-2, in Dimnent Memorial Chapel.